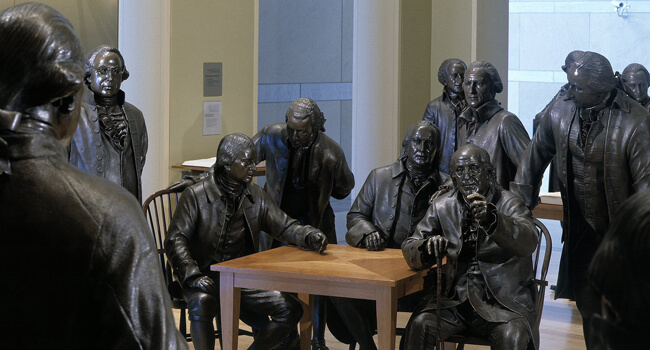 Signers Hall at the National Constitution Center allows visitors to see historical giants in a more life-sized context. Experience the power, fascination and drama of the National Constitution Center, the world’s first and only museum devoted to the U.S. Constitution. See the dramatic live presentation “Freedom Rising” on how the document came to be, then see the news in a different light with “Living News,” in which live actors bring today’s headlines to life in a manner designed to spark debate. Satisfy your groups’ appetites with delicious food from more than 80 merchants at Reading Terminal Market, an authentic 115-year old farmers market in the heart of Center City. After lunch, head to Independence National Historical Park for a walking tour of “Americas most historic square mile,” including the Liberty Bell, Independence Hall and Franklin Court. Also, don’t miss the oldest residential street in America, Elfreth’s Alley, famous flag maker Betsy Ross’ House and Christ Church and Burial Ground — the final resting place of Benjamin Franklin. Then: welcome to July 3, 1776! Start your evening with a delicious, three-course, Colonial-style meal at the historic City Tavern where you will meet several period characters. Follow that with a sound-and-light show with Lights of Liberty in Independence National Historical Park. Guests become immersed in animated imagery and special effects that tell the story of the American Revolution as it happened, where it happened. After breakfast head to South Philadelphia to the Philadelphia Sport Complex for tours of Lincoln Financial Field, home of the Eagles; the Wells Fargo Center (formerly the Wachovia Center), home of the Flyers and 76ers; and Citizens Bank Park, home of the Phillies. Visit player locker rooms, the press box, luxury seating levels and member clubs, the arena vision studio control room and even get field-, court- or rink-level view. Don’t miss the Phillies clubhouse, indoor batting cages and Hall of Fame club while at Citizens Bank Park. Stop for lunch at the Italian Market, with more than 125 years of history and tradition you are sure to find something for everyone. You won’t want to miss this market whose claim to fame is not only its fresh produce and delicious food, but its feature in the Philadelphia favorite, Rocky movie. Load your group on board a double-decker bus or a historic trolley for a 90-minute tour of Center City Philadelphia. Professional guides will provide a wealth of interesting and fun facts about the city’s history, attractions and architecture. Tour includes a stop at the Philadelphia Museum of Art for a run up the steps made famous in Rocky. Dine along the waterfront aboard the largest four-masted ship still afloat, Moshulu, a four-diamond restaurant, or take a dinner cruise aboard the Spirit of Philadelphia. Experience the world’s largest outdoor art museum and one of the nation’s most innovative art programs on a Mural Arts Tour. With more than 3,000 outdoor and indoor murals, Philadelphia is the unofficial “Mural Capital of the World.” Learn about the artistic elements, inspiration and decision-making that goes into creating a mural during this 25th Anniversary Tour. And, because inspiration is contagious, after the tour you will have the opportunity to paint part of a mural with a local mural artist! Have lunch at an Avenue of the Arts restaurant, complete with a guest curator or artist talk, with a representative from one of our many fine museums or arts and cultural institutions. Take a behind-the-scenes tour of the Kimmel Center for the Performing Arts, a cultural and architectural masterpiece on the Avenue of the Arts and home of the world-renowned Philadelphia Orchestra. Head north up Broad Street for a look at The Academy of Music, the oldest European-style opera house in use in the U.S. that today hosts many world-class performances. Complete your afternoon with a themed tour of the Philadelphia Museum of Art, with its collection of more than a half-million paintings, sculptures, artifacts and French Impressionist works. Dine and take in the sites at Water Works Restaurant and Lounge located directly behind the Philadelphia Museum of Art along the banks of the Schuylkill River. The site is a National Historical Landmark and has spectacular views of Boathouse Row. Spend your evening at a captivating performance by the Pennsylvania Ballet, the world-renowned Philadelphia Orchestra or the award winning Opera Company of Philadelphia.